A few months ago, I had the good fortune of attending a Disney blogger event, where we previewed three fantastic Disney features, including Secret of the Wings, the newest Tinker Bell movie. As part of that experience, I met Tink's sister, Periwinkle. You're never too old for Disneyland. I was making trips to Disney as an adult — well before I had kids. In fact, my now-husband and I went together shortly after we got engaged. There's something magical about the happiest place on earth and you don't have to be a child to experience it. When I recently attended a blogging event with a group of (grown) women, we were all extremely excited to meet Tinker Bell and the newest member of the family, Periwinkle. Peri is Tink's long-lost sister, who you will meet in Secret of the Wings, which flutters into stores on DVD beginning today, October 23. The newest fairy was as darling as her sister! As happy as I was to have my picture taken with them, I couldn't help but feel a little self conscious. When you're standing next to two tiny fairies, there's not much you can do about looking like a giant! 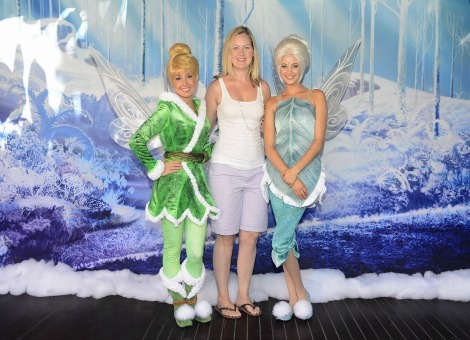 Fellow allParenting writer Nichole Beaudry also met Tinker Bell and Periwinkle. 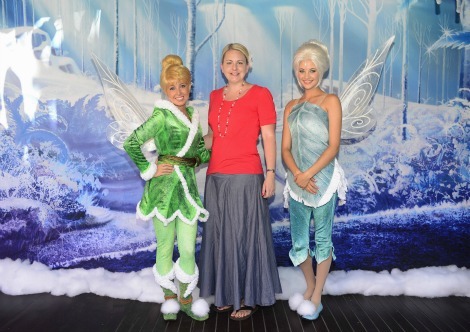 We're not the only ones who were recently photographed with Tinker Bell and Periwinkle. Over the weekend, the fairies walked the red carpet along with the movie talent at the New York premier of Secret of the Wings. Mae Whitman, the voice of Tink, is pictured here with the lovely fairy sisters. See it!^You can pick up your copy of Secret of the Wings on 3D Blu-ray, Blu-ray, DVD and Digital Download today. I've seen all of the past Tinker Bell movies at least 10 times (no, I'm not exaggerating — my 4-year-old is quite the fan) and while they're all really good, Secret of the Wings was my favorite.